Becker, B., & Lynch, S. (2018). Case Report: Aquatic Therapy and End-Stage Dementia. PM&R, 10(4), 437-441. Pochmann, D. et al. (2018). Cytokine modulation in response to acute and chronic aquatic therapy intervention in Parkinson disease individuals: A pilot study. Neuroscience Letters, 674, 30-35. Caputo, G. et al. (2018). Effectiveness of a Multisystem Aquatic Therapy for Children with Autism Spectrum Disorders. Journal Of Autism And Developmental Disorders, 48(6), 1945-1956. Yeung, W., & Semciw, A. (2018). Aquatic Therapy for People with Lymphedema: A Systematic Review and Meta-analysis. Lymphatic Research And Biology, 16(1), 9-19. Pérez-de la Cruz, S. (2018). A bicentric controlled study on the effects of aquatic Ai Chi in Parkinson disease. Complementary Therapies In Medicine, 36, 147-153. Henwood, T., Neville, C., Baguley, C., & Beattie, E. (2017). Aquatic exercise for residential aged care adults with dementia: benefits and barriers to participation. International Psychogeriatrics, 29(09), 1439-1449. Franco, M., Morelhão, P., de Carvalho, A., & Pinto, R. (2017). Aquatic Exercise for the Treatment of Hip and Knee Osteoarthritis. Physical Therapy, 97(7), 693-697. Zão, A., & Cantista, P. (2017). The role of land and aquatic exercise in ankylosing spondylitis: a systematic review. Rheumatology International, 37(12), 1979-1990. Hind, D. et al. (2017). Aquatic therapy for children with Duchenne muscular dystrophy: a pilot feasibility randomised controlled trial and mixed-methods process evaluation. Health Technology Assessment, 21(27), 1-120. Zivi, I. et al. (2017). Effectiveness of aquatic versus land physiotherapy in the treatment of peripheral neuropathies: a randomized controlled trial. Clinical Rehabilitation, 32(5), 663-670. Alaniz, M., Rosenberg, S., Beard, N., & Rosario, E. (2017). The Effectiveness of Aquatic Group Therapy for Improving Water Safety and Social Interactions in Children with Autism Spectrum Disorder: A Pilot Program. Journal Of Autism And Developmental Disorders, 47(12), 4006-4017. Covill, L., Utley, C., & Hochstein, C. (2017). Comparison of Ai Chi and Impairment-Based Aquatic Therapy for Older Adults With Balance Problems. Journal Of Geriatric Physical Therapy, 40(4), 204-213. Wall, T., Falvo, L., & Kesten, A. (2017). Activity-specific aquatic therapy targeting gait for a patient with incomplete spinal cord injury. Physiotherapy Theory And Practice, 33(4), 331-344. Hind, D. et al. (2017). Aquatic therapy for boys with Duchenne muscular dystrophy (DMD): an external pilot randomised controlled trial. Pilot And Feasibility Studies, 3:16. M. Hakim, R., D. Ross, M., Runco, W., & T. Kane, M. (2017). A community-based aquatic exercise program to improve endurance and mobility in adults with mild to moderate intellectual disability. Journal Of Exercise Rehabilitation, 13(1), 89-94. Kutzner, I. et al. (2017). Does aquatic exercise reduce hip and knee joint loading? In vivo load measurements with instrumented implants. PLoS One, 12(3), e0171972. Li, C., Khoo, S., & Adnan, A. (2017). Effects of aquatic exercise on physical function and fitness among people with spinal cord injury. Medicine, 96(11), e6328. Waller, B. et al. (2017). Effects of high intensity resistance aquatic training on body composition and walking speed in women with mild knee osteoarthritis: a 4-month RCT with 12-month follow-up. Osteoarthritis And Cartilage, 25(8), 1238-1246. Palamara, G. et al. (2017). Land Plus Aquatic Therapy Versus Land-Based Rehabilitation Alone for the Treatment of Balance Dysfunction in Parkinson Disease: A Randomized Controlled Study With 6-Month Follow-Up. Archives Of Physical Medicine And Rehabilitation, 98(6), 1077-1085. Barakat, R., Perales, M., Cordero, Y., Bacchi, M., & Mottola, M. (2017). Influence of Land or Water Exercise in Pregnancy on Outcomes. Medicine & Science In Sports & Exercise, 49(7), 1397-1403. Casilda-López, J., Valenza, M., Cabrera-Martos, I., Díaz-Pelegrina, A., Moreno-Ramírez, M., & Valenza-Demet, G. (2017). Effects of a dance-based aquatic exercise program in obese postmenopausal women with knee osteoarthritis. Menopause, 24(7), 768-773. McIlroy, S., Sayliss, L., Browning, P., & Bearne, L. (2017). Aquatic therapy for people with persistent knee pain: A feasibility study. Musculoskeletal Care, 15(4), 350-355. Suntraluck, S., Tanaka, H., & Suksom, D. (2017). The Relative Efficacy of Land-Based and Water-Based Exercise Training on Macro- and Microvascular Functions in Older Patients With Type 2 Diabetes. Journal Of Aging And Physical Activity, 25(3), 446-452. Carroll, L., Volpe, D., Morris, M., Saunders, J., & Clifford, A. (2017). Aquatic Exercise Therapy for People With Parkinson Disease: A Randomized Controlled Trial. Archives Of Physical Medicine And Rehabilitation, 98(4), 631-638. Kurt, E., Büyükturan, B., Büyükturan, Ö., Erdem, H., & Tuncay, F. (2017). Effects of Ai Chi on balance, quality of life, functional mobility, and motor impairment in patients with Parkinson’s disease. Disability And Rehabilitation, 40(7), 791-797. Cunha, R. et al. (2017). Acute blood pressure response in hypertensive elderly women immediately after water aerobics exercise: A crossover study. Clinical And Experimental Hypertension, 39(1), 17-22. Frye, S., Ogonowska-Slodownik, A., & Geigle, P. (2017). Aquatic Exercise for People With Spinal Cord Injury. Archives Of Physical Medicine And Rehabilitation, 98(1), 195-197. Adsett, J. et al. (2017). Aquatic Exercise Training is Effective in Maintaining Exercise Performance in Trained Heart Failure Patients: A Randomised Crossover Pilot Trial. Heart, Lung And Circulation, 26(6), 572-579. Siqueira, U., Orsini Valente, L., de Mello, M., Szejnfeld, V., & Pinheiro, M. (2017). Effectiveness of Aquatic Exercises in Women With Rheumatoid Arthritis. American Journal Of Physical Medicine & Rehabilitation, 96(3), 167-175. Chard, S. (2017). Qualitative perspectives on aquatic exercise initiation and satisfaction among persons with multiple sclerosis. Disability And Rehabilitation, 39(13), 1307-1312. So, B. et al. (2017). The effect of Ai Chi aquatic therapy on individuals with knee osteoarthritis: a pilot study. Journal Of Physical Therapy Science, 29(5), 884-890. Güeita-Rodríguez, J., García-Muro, F., Rodríguez-Fernández, Á., Lambeck, J., Fernández-de-las-Peñas, C. & Palacios-Ceña, D. (2017). What areas of functioning are influenced by aquatic physiotherapy? Experiences of parents of children with cerebral palsy. Developmental Neurorehabilitation, 1-9. Roostaei, M., Baharlouei, H., Azadi, H. & Fragala-Pinkham, M. (2016). Effects of Aquatic Intervention on Gross Motor Skills in Children with Cerebral Palsy: A Systematic Review. Physical & Occupational Therapy In Pediatrics, 37(5), 496-515. Zhu, Z. et al. (2016). Hydrotherapy vs. conventional land-based exercise for improving walking and balance after stroke: a randomized controlled trial. Clinical Rehabilitation, 30(6), 587-593. Pérez-de la Cruz, S., García Luengo, A., & Lambeck, J. (2016). Efectos de un programa de prevención de caídas con Ai Chi acuático en pacientes diagnosticados de parkinson. Neurología, 31(3), 176-182. Delevatti, R. et al. (2016). Glucose control can be similarly improved after aquatic or dry-land aerobic training in patients with type 2 diabetes: A randomized clinical trial. Journal Of Science And Medicine In Sport, 19(8), 688-693. Rewald, S., Mesters, I., Lenssen, A., Emans, P., Wijnen, W., & de Bie, R. (2016). Effect of aqua-cycling on pain and physical functioning compared with usual care in patients with knee osteoarthritis: study protocol of a randomised controlled trial. BMC Musculoskeletal Disorders, 17:88. Munukka, M. et al. (2016). Efficacy of progressive aquatic resistance training for tibiofemoral cartilage in postmenopausal women with mild knee osteoarthritis: a randomised controlled trial. Osteoarthritis And Cartilage, 24(10), 1708-1717. Milares, L. et al. (2016). Effectiveness of an aquatic exercise program and low-level laser therapy on articular cartilage in an experimental model of osteoarthritis in rats. Connective Tissue Research, 57(5), 398-407. Chen, L., Fox, K., Ku, P., & Chang, Y. (2016). Effects of Aquatic Exercise on Sleep in Older Adults with Mild Sleep Impairment: a Randomized Controlled Trial. International Journal Of Behavioral Medicine, 23(4), 501-506. Park, B. et al. (2016). A comparative study of the effects of trunk exercise program in aquatic and land-based therapy on gait in hemiplegic stroke patients. Journal Of Physical Therapy Science, 28(6), 1904-1908. Kim, K., Lee, D., & Kim, E. (2016). Effect of aquatic dual-task training on balance and gait in stroke patients. Journal Of Physical Therapy Science, 28(7), 2044-2047. Skinner, E., Dinh, T., Hewitt, M., Piper, R., & Thwaites, C. (2016). An Ai Chi-based aquatic group improves balance and reduces falls in community-dwelling adults: A pilot observational cohort study. Physiotherapy Theory And Practice, 32(8), 581-590. Zhang, Y. et al. (2016). Aquatic Therapy Improves Outcomes for Subacute Stroke Patients by Enhancing Muscular Strength of Paretic Lower Limbs Without Increasing Spasticity. American Journal of Physical Medicine & Rehabilitation, 95(11), 840-849. Ryu, K. et al. (2016). Effects of assisted aquatic movement and horseback riding therapies on emotion and brain activation in patients with cerebral palsy. Journal of Physical Therapy Science, 28(12), 3283-3287. Gibson, A. and Shields, N. (2015). Effects of Aquatic Therapy & Land-Based Therapy versus Land-Based Therapy Alone on Range of Motion, Edema, and Function after Hip or Knee Replacement: A Systematic Review and Meta-analysis. Physiotherapy Canada, 67(2), 133-141. Schaefer, S., Louder, T., Foster, S. & Bressel, E. (2015). Effect of Water Immersion on Dual-task Performance: Implications for Aquatic Therapy. Physiotherapy Research International, 21(3), 147-154. Cugusi, L. et al. (2015). Effects of an Aquatic-Based Exercise Program to Improve Cardiometabolic Profile, Quality of Life, and Physical Activity Levels in Men With Type 2 Diabetes Mellitus. PM&R, 7(2), 141-148. Irandoust, K., & Thaeri, M. (2015). The effects of aquatic exercise on body composition and nonspecific low back pain in ederly males. Journal of Physical Therapy Science, 27(2), 433-435. Pires, D., Cruz, E. B., & Caeiro, C. (2015). Aquatic exercise and pain neurophysiology education versus aquatic exercise alone for patients with chronic low back pain: a randomized controlled trial. Clinical Rehabilitation, 29(6), 538-547. Lu, M., et al. (2015). Effectiveness of aquatic exercise for treatment of knee osteoarthritis. Zeitschrift Für Rheumatologie, 74(6), 543-552. Rewald, S., Mesters, I., Emans, P., Arts, J., Lenssen, A., & Bie, R. (2015). Aquatic circuit training including aqua-cycling in patients with knee osteoarthritis: A feasibility study. Journal Of Rehabilitation Medicine, 47(4), 376-381. Fernández García, R., Sánchez Sánchez, C., López Rodríguez, M., & Sánchez Granados, G. (2015). Effects of an exercise and relaxation aquatic program in patients with spondyloarthritis: A randomized trial. Medicina Clínica (English Edition), 145(9), 380-384. Burmaster, C., Eckenrode, B., & Stiebel, M. (2015). Early Incorporation of an Evidence-Based Aquatic-Assisted Approach to Arthroscopic Rotator Cuff Repair Rehabilitation: Prospective Case Study. Physical Therapy, 96(1), 53-61. Pérez de la Cruz, S., & Lambeck, J. (2015). Efectos de un programa de Ai Chi acuático en pacientes con fibromialgia. Estudio piloto. Neurología, 60(2), 59-65. Zanoni, C., Galvão, F., Cliquet Junior, A. & Saad, S. (2015). Pilot randomized controlled trial to evaluate the effect of aquatic and land physical therapy on musculoskeletal dysfunction of sickle cell disease patients. Revista Brasileira de Hematologia e Hemoterapia, 37(2), 82-89. Marinho-Buzelli, A., Bonnyman, A. & Verrier, M. (2014). The effects of aquatic therapy on mobility of individuals with neurological diseases: a systematic review. Clinical Rehabilitation, 29(8), 741-751. Pechter, Ü., Raag, M. & Ots-Rosenberg, M. (2014). Regular aquatic exercise for chronic kidney disease patients. International Journal of Rehabilitation Research, 37(3), 251-255. Cuesta-Vargas, A., White, M., González-Sánchez, M. & Kuisma, R. (2014). The optimal frequency of aquatic physiotherapy for individuals with chronic musculoskeletal pain: a randomised controlled trial. Disability and Rehabilitation, 37(4), 311-318. Lai, C., Liu, W., Yang, T., Chen, C., Wu, C. & Chan, R. (2014). Pediatric Aquatic Therapy on Motor Function and Enjoyment in Children Diagnosed With Cerebral Palsy of Various Motor Severities. Journal of Child Neurology, 30(2), 200-208. Beltrame, L., Abreu, L., Almeida, J., & Boullosa, D. (2014). The acute effect of moderate intensity aquatic exercise on coagulation factors in haemophiliacs. Clinical Physiology And Functional Imaging, 35(3), 191-196. Dundar, U. et al. (2014). Effect of aquatic exercise on ankylosing spondylitis: a randomized controlled trial. Rheumatology International, 34(11), 1505-1511. Baena-Beato, P., Artero, E., Arroyo-Morales, M., Robles-Fuentes, A., Gatto-Cardia, M. & Delgado-Fernández, M. (2013). Aquatic therapy improves pain, disability, quality of life, body composition and fitness in sedentary adults with chronic low back pain. A controlled clinical trial. Clinical Rehabilitation, 28(4), 350-360. Baena-Beato, P. A., Arroyo-Morales, M., Delgado-Fernández, M., Gatto-Cardia, M. C., & Artero, E. G. (2013). Effects of different frequencies (2-3 Days/Week) of Aquatic Therapy program in adults with chronic low back pain. A Non-randomized comparison trial. Pain Medicine, 14(1), 145-158. Asimenia, G., Paraskevi, M., Polina, S., Anastasia, B., Kyriakos, T., & Georgios, G. (2013). Aquatic Training for Ankle Instability. Foot & Ankle Specialist, 6(5), 346-351. Fragala-Pinkham, M., Smith, H., Lombard, K., Barlow, C. & O’Neil, M. (2013). Aquatic aerobic exercise for children with cerebral palsy: a pilot intervention study. Physiotherapy Theory and Practice, 30(2), 69-78. Tripp, F. & Krakow, K. (2013). Effects of an aquatic therapy approach (Halliwick-Therapy) on functional mobility in subacute stroke patients: a randomized controlled trial. Clinical Rehabilitation, 28(5), 432-439. Lima, T. et al. (2013). The effectiveness of aquatic physical therapy in the treatment of fibromyalgia: a systematic review with meta-analysis. Clinical Rehabilitation, 27(10), 892-908. Villalta, E. & Peiris, C. (2013). Early Aquatic Physical Therapy Improves Function and Does Not Increase Risk of Wound-Related Adverse Events for Adults After Orthopedic Surgery: A Systematic Review and Meta-Analysis. Archives of Physical Medicine and Rehabilitation, 94(1), 138-148. Baena-Beato, P., Arroyo-Morales, M., Delgado-Fernêndez, M., Gatto-Cardia, M. & Artero, E. (2013). Effects of Different Frequencies (2–3 Days/Week) of Aquatic Therapy Program in Adults with Chronic Low Back Pain. A Non-Randomized Comparison Trial. Pain Medicine, 14(1), 145-158. Roper, J., Bressel, E., & Tillman, M. (2013). Acute Aquatic Treadmill Exercise Improves Gait and Pain in People With Knee Osteoarthritis. Archives Of Physical Medicine And Rehabilitation, 94(3), 419-425. Castro-Sánchez, A., Matarán-Peñarrocha, G., Lara-Palomo, I., Saavedra-Hernández, M., Arroyo-Morales, M., & Moreno-Lorenzo, C. (2012). Hydrotherapy for the Treatment of Pain in People with Multiple Sclerosis: A Randomized Controlled Trial. Evidence-Based Complementary And Alternative Medicine, (2012), 1-8. Bellomo, R., Barassi, G., Iodice, P., Di Pancrazio, L., Megna, M., & Saggini, R. (2012). Visual Sensory Disability: Rehabilitative Treatment in an Aquatic Environment. International Journal Of Immunopathology And Pharmacology, 25(1_suppl), 17-22. Gorter, J. & Currie, S. (2011). Aquatic Exercise Programs for Children and Adolescents with Cerebral Palsy: What Do We Know and Where Do We Go? International Journal of Pediatrics, 2011, 1-7. Vivas, J., Arias, P. & Cudeiro, J. (2011). Aquatic Therapy Versus Conventional Land-Based Therapy for Parkinson’s Disease: An Open-Label Pilot Study. Archives of Physical Medicine and Rehabilitation, 92(8), 1202-1210.Vivas, J., Arias, P. & Cudeiro, J. (2011). Aquatic Therapy Versus Conventional Land-Based Therapy for Parkinson’s Disease: An Open-Label Pilot Study. Archives of Physical Medicine and Rehabilitation, 92(8), 1202-1210. Ballaz, L., Plamondon, S. & Lemay, M. (2011). 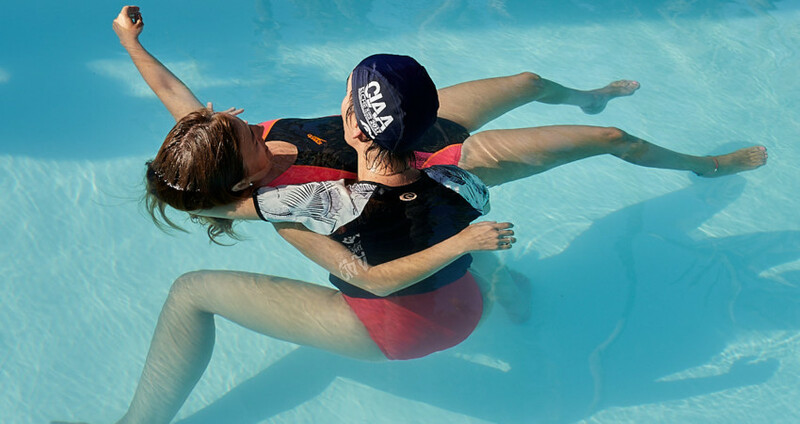 Group aquatic training improves gait efficiency in adolescents with cerebral palsy. Disability and Rehabilitation, 33(17-18), 1616-1624. Bello, A. I., Kalu, N. H., Adegoke, B. O. A., & Agyepong-Badu, S. (2010). Hydrotherapy versus land-based exercises in the management of chronic low back pain: a comparative study. Journal of Musculoskeletal Research, 13(4), 159-165. Salem, Y. & Jaffee Gropack, S. (2010). Aquatic Therapy for a Child with Type III Spinal Muscular Atrophy: A Case Report. Physical & Occupational Therapy In Pediatrics, 30(4), 313-324. Retarekar, R., Fragala-Pinkham, M. & Townsend, E. (2009). Effects of Aquatic Aerobic Exercise for a Child with Cerebral Palsy Single-Subject Design. Pediatric Physical Therapy, 21(4), 336-344. Rahmann, A., Brauer, S. & Nitz, J. (2009). A Specific Inpatient Aquatic Physiotherapy Program Improves Strength After Total Hip or Knee Replacement Surgery: A Randomized Controlled Trial. Archives of Physical Medicine and Rehabilitation, 90(5), 745-755. Waller, B., Lambeck, J. & Daly, D. (2009). Therapeutic aquatic exercise in the treatment of low back pain: a systematic review. Clinical Rehabilitation, 23(1), 3-14. Dundar, U., Solak, O., Yigit, I., Evcik, D., & Kavuncu, V. (2009). Clinical Effectiveness of Aquatic Exercise to Treat Chronic Low Back Pain. Spine, 34(14), 1436-1440. Becker, B. (2009). Aquatic Therapy: Scientific Foundations & Clinical Rehabilitation Applications. PM&R, 1(9), 859-872. Fragala-Pinkham, M., Dumas, H., Barlow, C. & Pasternak, A. (2009). An Aquatic Physical Therapy Program at a Pediatric Rehabilitation Hospital: A Case Series. Pediatric Physical Therapy, 21(1), 68-78. Dong Koog Noh, Lim, J., Shin, H. & Paik, N. (2008). The effect of aquatic therapy on postural balance and muscle strength in stroke survivors — a randomized controlled pilot trial. Clinical Rehabilitation, 22(10-11), 966-976. Munguía-Izquierdo, D., & Legaz-Arrese, A. (2008). Assessment of the Effects of Aquatic Therapy on Global Symptomatology in Patients With Fibromyalgia Syndrome: A Randomized Controlled Trial. Archives Of Physical Medicine And Rehabilitation, 89(12), 2250-2257. Fragala-Pinkham, M., Haley, S. y O’Neil, M. (2008). Group aquatic aerobic exercise for children with disabilities. Developmental Medicine & Child Neurology, 50(11), 822-827. Evcik, D., Yigit, I., Pusak, H. & Kavuncu, V. (2008). Effectiveness of aquatic therapy in the treatment of fibromyalgia syndrome: a randomized controlled open study. Rheumatology International, 28(9), 885-890. Bartels, EM., Lund, H., Hagen, KB., Dagfinrud, H., Christensen, R., & Danneskiold-Samsøe, B. (2007). Aquatic exercise for the treatment of knee and hip osteoarthritis. Cochrane Database Of Systematic Reviews. 17(4):CD005523. Hinman, R., Heywood, S. & Day, A. (2007). Aquatic Physical Therapy for Hip and Knee Osteoarthritis: Results of a Single-Blind Randomized Controlled Trial. Physical Therapy, 87(1), 32-43. Vonder Hulls, D., Walker, L., & Powell, J. (2006). Clinicians’ Perceptions of the Benefits of Aquatic Therapy for Young Children with Autism: a preliminary study. Physical & Occupational Therapy In Pediatrics, 26(1), 13-22. Ay, A., & Yurtkuran, M. (2005). Influence of Aquatic and Weight-Bearing Exercises on Quantitative Ultrasound Variables in Postmenopausal Women. American Journal Of Physical Medicine & Rehabilitation, 84(1), 52-61. Kelly, M. & Darrah, J. (2005). Aquatic exercise for children with cerebral palsy. Developmental Medicine & Child Neurology, 47(12), 838. Hall, J., Grant, J., Blake, D., Taylor, G., & Garbutt, G. (2004). Cardiorespiratory responses to aquatic treadmill walking in patients with rheumatoid arthritis. Physiotherapy Research International, 9(2), 59-73. Driver, S., O’connor, J., Lox, C., & Rees, K. (2004). Evaluation of an aquatics programme on fitness parameters of individuals with a brain injury. Brain Injury, 18(9), 847-859. Takken, T. (2003). Aquatic fitness training for children with juvenile idiopathic arthritis. Rheumatology, 42(11), 1408-1414. Pechter, U. et al. (2003). Beneficial effects of water-based exercise in patients with chronic kidney disease. International Journal Of Rehabilitation Research, 26(2), 153-156. Gyurcsik, N., Estabrooks, P., & Frahm-Templar, M. (2003). Exercise-related goals and self-efficacy as correlates of aquatic exercise in individuals with arthritis. Arthritis & Rheumatism, 49(3), 306-313. Pechter, U. (2003). Regular low-intensity aquatic exercise improves cardio-respiratory functional capacity and reduces proteinuria in chronic renal failure patients. Nephrology Dialysis Transplantation, 18(3), 624-625. Wyatt, F., Milam, S., Manske, R., & Deere, R. (2001). The Effects of Aquatic and Traditional Exercise Programs on Persons With Knee Osteoarthritis. Journal Of Strength And Conditioning Research, 15(3), 337-340. Karamzadeh, A., & Armstrong, W. (2001). Aquatic Activities after Total Laryngectomy. Otolaryngology-Head And Neck Surgery, 125(5), 528-532. Dumas, H., & Francesconi, S. (2001). Aquatic Therapy in Pediatrics. Physical & Occupational Therapy In Pediatrics, 20(4), 63-78. Suomi, R., & Koceja, D. (2000). Postural sway characteristics in women with lower extremity arthritis before and after an aquatic exercise intervention. Archives Of Physical Medicine And Rehabilitation, 81(6), 780-785. Prins, J., & Cutner, D. (1999). Aquatic therapy in the rehabilitation of athletic injuries. Clinics In Sports Medicine, 18(2), 447-461. Ariyoshi, M. et al. (1999). Efficacy of Aquatic Exercises for Patients with Low-back Pain. The Kurume Medical Journal, 46(2), 91-96. Konlian, C. (1999). Aquatic therapy: Making a wave in the treatment of low back injuries. Journal Of Orthopaedic Nursing, 3(3), 181. Thein, J., & Brody, L. (1998). Aquatic-Based Rehabilitation and Training for the Elite Athlete. Journal Of Orthopaedic & Sports Physical Therapy, 27(1), 32-41. Spencer, A., Kinne, S., Belza, B., Ramsey, S., & Patrikc, D. (1998). Recruiting adults with osteoarthritis into an aquatic exercise class: Strategies for a statewide intervention. Arthritis Care & Research, 11(6), 455-462. Templeton, M., Booth, D., & O’Kelly, W. (1996). Effects of Aquatic Therapy on Joint Flexibility and Functional Ability in Subjects With Rheumatic Disease. Journal Of Orthopaedic & Sports Physical Therapy, 23(6), 376-381. Morris, D. (1994). Aquatic Rehabilitation for the Treatment of Neurological Disorders. Journal Of Back And Musculoskeletal Rehabilitation, 4(4), 297-308. Moschetti, M., & Cole, A. (1994). Aquatics: Risk Management Strategies for the Therapy Pool. Journal Of Back And Musculoskeletal Rehabilitation, 4(4), 265-272. Bacon, M., Nicholson, C., Binder, H., & White, P. (1991). Juvenile rheumatoid arthritis aquatic exercise and lower-extremity function. Arthritis Care & Research, 4(2), 102-105. Johnson, C. (1988). Aquatic Therapy for an ALS Patient. American Journal Of Occupational Therapy, 42(2), 115-120. Weinstein, L. (1986). The Benefits of Aquatic Activity. Journal Of Gerontological Nursing, 12(2), 6-11. Gehlsen, G., Grigsby, S., & Winant, D. (1984). Effects of an Aquatic Fitness Program on the Muscular Strength and Endurance of Patients with Multiple Sclerosis. Physical Therapy, 64(5), 653-657.